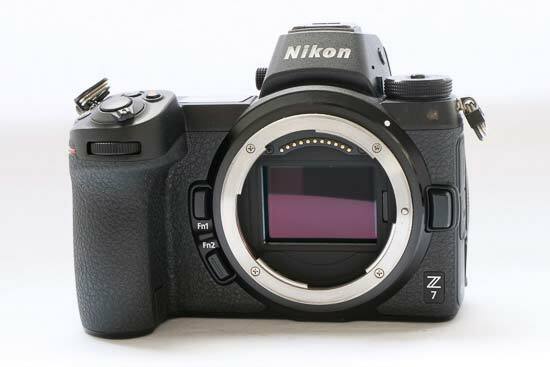 The Nikon Z7 full-frame mirrorless camera - Nikon’s first - was introduced in August 2018 after several weeks of speculation and online teasers. The Nikon Z7 was launched as part of Nikon’s brand new “Z system”, and debuted alongside its more affordable sibling the Z6. Both use the same body design, but are equipped with slightly different internal specifications. 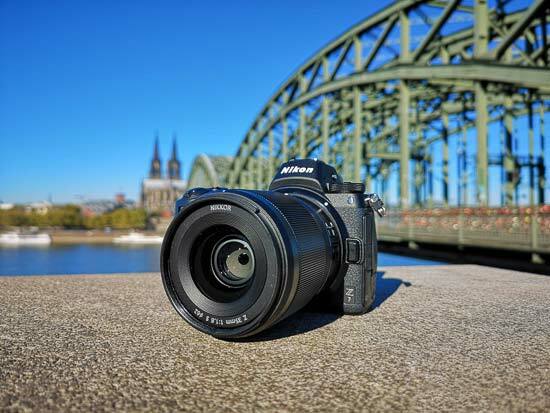 The Nikon Z7 is the first of the pair to arrive in an increasingly competitive market for mirrorless cameras, and makes its entry with a £3,399 / $3,399 price point (body only). This compares with Nikon’s wildly popular D850 DSLR at £2999 / $3300. It will face stiff competition from Sony’s breakout, high-end mirrorless success the A7R III, as well as Canon’s still-new full-frame mirrorless camera the EOS R.
As the Z series uses a brand new mount, a new range of lenses is also being launched, along with a Z-mount adapter which can be bought with the Nikon Z7 as part of a kit. 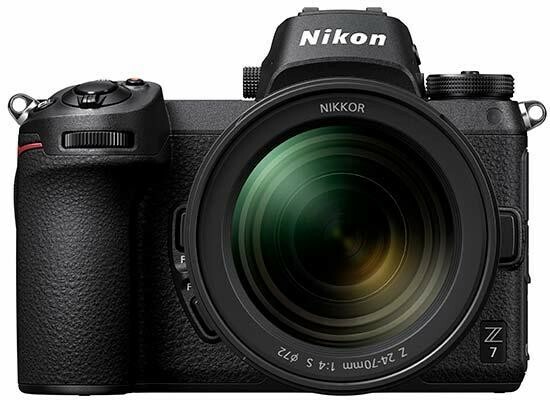 In terms of design, Nikon has very much stuck with what it knows with the Z7, creating a full-frame mirrorless camera which, in essence, looks very similar to a small DSLR. It keeps the body of the camera chunky enough to be comfortable to use, while still reducing the size somewhat. Importantly, it remains relatively well-balanced even if you choose to use heavier lenses. 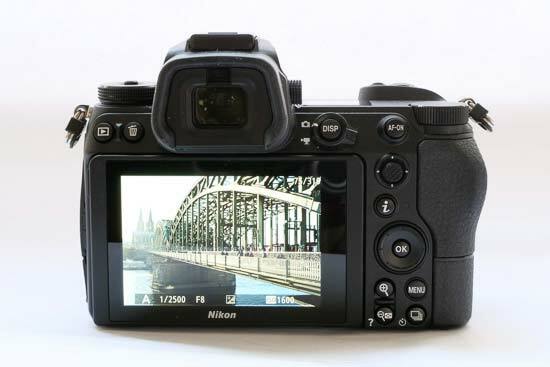 The layout of the buttons and so on is also extremely similar to existing Nikon cameras – if you’re already used to using one of Nikon's DSLRs you should very comfortable using the Z7. There’s also weatherproofing, which is claimed to be to the same level as the D850, while the overall build quality feels very robust and well-made. During testing, it was used during a heavy downpour to shoot a football match and survived to tell the tale. On the back of the camera, the majority of the buttons are found grouped on the right hand side. You’ve also got a joystick which you can use to move focus points around the frame – it’s also got a ridged coating to help you easily lay your thumb on it when using the viewfinder. Although it’s not possible to use the touch-sensitive screen while looking through the viewfinder, it’s a fast enough experience using the joystick for it not to be too much of a problem. Otherwise there’s very familiar (to Nikon shooters) buttons in the shape of an AF-On button, Menu button and a switch for flicking between shooting video and shooting stills. The new Z mount has been given four connection points, rather than three, making it feel very secure when attaching lenses to it. Just to the right of the lens mount you’ll find two customisable function buttons, while on its left is the lens release button. On the top of the Nikon Z7 is a mode dial for quickly moving between the various exposure modes the camera offers. You’ll find M/A/S/P as well as a fully automatic option, plus space for three different groups of custom settings. In order to move the dial, you’ll need to hold down a button in the middle of the dial – which helps to prevent accidental changes in bags and so on. Also on the top you’ll find a dial for changing certain settings depending on the shooting mode you’re in, which can be used in conjunction with a secondary dial built into the camera’s grip. Around the on/off switch is a video record button, ISO button and exposure compensation button, while the shutter release is found in the centre of the switch. A top panel displays key shooting settings, such as shutter speed, aperture, ISO and so on. 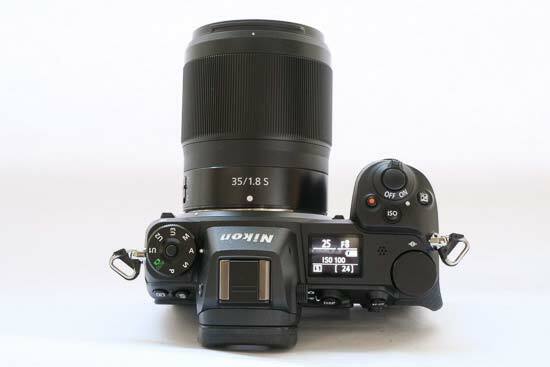 A high-resolution, class-leading, 3.6-million-dot EVF is used on both mirrorless cameras, offering 0.8x magnification. In use, the EVF is fantastic, with lots of detail and an extremely pleasant view of the scene. The Nikon Z7 uses a 2.1-million dot tilting touch-sensitive screen. The touch options have been very well implemented, and makes it a much pleasant experience than shooting with Sony's A7R III. (See our Sony A7R III review here.) You can use the screen to make various selections in either the main or quick menu (which is accessed by pressing the “I” button on the back of the camera). 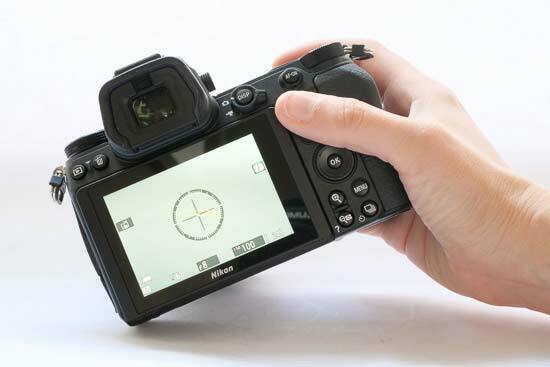 You can also use it to select a specific focus point around the frame – one slight disappointment is that you can’t use the touchscreen in conjunction with the electronic viewfinder, though. As the Nikon Z7 is a mirrorless camera, you can now activate a truly silent mode, something which pros will likely find useful in a wide variety of scenarios. For example, wedding photographers shooting in a quiet church, or sports photographers keen not to disturb an all-important golf swing can take advantage of zero shutter noise. Of course this is not something which is new to the market -- mirrorless cameras in 2018 aren't a novelty — but it does open up some new photographic opportunities. Even without silent shutter activated, the shutter sound isn’t too loud. Aside from the differences in sensor resolution, another difference between the Z7 and the Z6 is the AF system. The higher resolution Z7 uses a 493-point hybrid AF system, while the Z6 uses a 273-point system. The Z7 offers 9fps shooting, while the Z6 can manage 12fps. The Nikon Z7 is clearly not targeted as a sports or action camera, but none-the-less it offers AF tracking when shooting under the Auto-Area AF mode. In practice, the Z7 struggles a little to keep track of particularly erratic or very fast-moving subjects. It’s as though the Z7 is ever so slightly behind the subject – that can result in pictures which don’t display critically sharp focus when zoomed in 100%, but still look good when used at smaller sizes. Overall, it’s easier to get good results when keeping the focus point on Single-Point AF or Wide-Area AF and trying to keep the subject underneath the same focus point where possible. Otherwise, for more static subjects, autofocusing is fast and accurate. In low light, a rather bright green autofocusing assist lamp can help to gain focus, but if you prefer discreetness that can be switched off. In which case, autofocusing in very low light can sometimes take a little longer to acquire focus, but it’s rare for it to be missed altogether. Wi-Fi and Bluetooth connectivity are included in both mirrorless cameras, with Nikon claiming that connections should be more stable than those seen in previous cameras thanks to a dedicated processor. On the whole, it works extremely well with an iPhone, but we’ve had less success with a Huawei P20 Pro. It could perhaps be because of aggressive power-saving management by the Huawei shutting down the app from running in the background, but it seems that it doesn’t want to maintain the automatic transfer unless the app is open on the phone. Still, it’s certainly a much smoother experience than in the past. A little controversially, Nikon has decided to equip both the Z6 and the Z7 with just a single XQD card slot. So far, the only other cameras available to buy on the market to use XQD cards are Nikon’s own high-end cameras, so for many buying the Nikon Z7, they’ll also have to factor in the expense of additional memory cards and readers. Having a single slot also means no back-up or overflow storage. 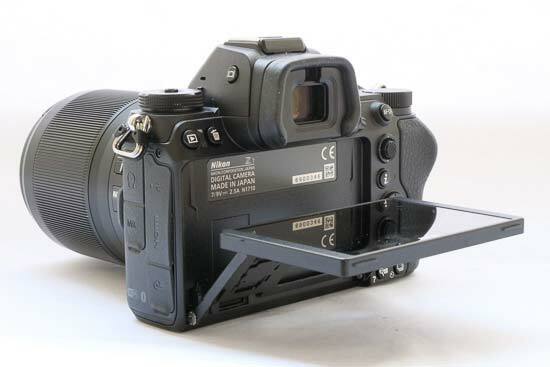 Nikon says that the reason for this is because there isn’t enough room for two XQD card slots, and, research suggests that relatively few photographers use a second card slot for backup. You only have to read forum posts and social media to see the uproar this has caused, but it’s certainly true that XQD cards are more robust than SD cards. It would also seem pretty likely that at some point in the future – distant or otherwise – Nikon will release an even higher-end mirrorless camera than the Nikon Z7 which will have multiple card slots. At launch, just three Z-mount lenses are announced for the mirrorless system – a 24-70 f/4, a 35mm f/1.8 and a 50mm f/1.8. Of those three, just the 24-70mm and the 35mm are available to buy from launch, with the 50mm expected later in the year. The new lens mount adaptor does not include a built-in autofocus motor, so, while that means it is compatible with Nikon’s extensive back catalogue of lenses, only those with focusing motors inside them will be compatible with the Z7/Z6’s autofocusing system. We’ve used the Nikon Z7 with a variety of existing F mount lenses and it has worked extremely well, displaying very little difference – if any – to using said lenses with something like a Z7. Third-party lenses should also work just as well in theory, but Nikon gives no guarantees of this. If you’ve got very old or unusual lenses you may also find that there’s limits to how the lenses work with the Z system, but that’s unlikely to be of huge concern to the vast majority of users. Battery life for the Nikon Z7 is rated at 330 shots, according to CIPA. This rating is granted using quite unrealistic methods, so in real-world shooting, you’re likely to get far more from the Z7. During our tests, we were able to fill a 32GB card and the battery depleted to 71%. During a 90-minute football game, two batteries were needed – but considering the camera was on – and in use – for pretty much the entirety of the game, this is a pretty good performance. Buying an extra battery for pro users is definitely recommended. The good news for existing D850 owners is that the battery is the same size and therefore is accepted by the Z7. If you’re using the Nikon Z7 as a backup camera, you will be able to share batteries between cameras. However, it’s worth noting that although the Z7 supports USB charging, older batteries (such as those found in the D850) cannot be charged in this way. There’s absolutely no doubt that Nikon users have been waiting for a viable mirrorless option for some time now. The ill-fated Nikon 1 series certainly didn’t tick the right boxes for the vast majority of pro photographers, while the Z7 finally feels like the company is heading in the right direction.